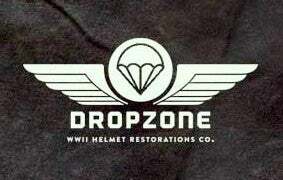 Dropzone Helmet Restorations Co. — Vietnam M-1C Helmet Liner. 1967 date. Complete. Vietnam M-1C Helmet Liner. 1967 date. Complete. HELMET LINER: This is a very nice 1967 dated (Also has a 1968 date) Vietnam Era Paratrooper liner. Webbing is in good/used condition. The outer textured green paint is the original US Army finish. Comes complete with a Nape strap, Sweatband and a U.S. stamped chin cup. Makes a fantastic display piece for your collection! What you see is what you will receive. Please note that finding and ALL ORIGINAL helmet like this is near impossible and if you did find one, it would be very very expensive. Need Extra pictures, please ask me.